The Review of Development in Transport in Asia and the Pacific is the biennial publication of Transport Division. It discussed the key contribution of transport to the achievement of the Sustainable Development Goals. 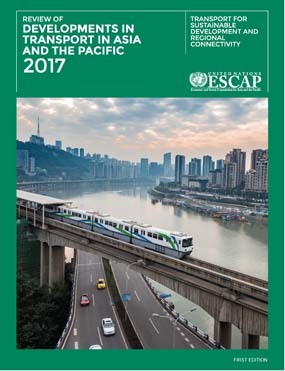 It looks at emerging trends in transport in the region and presents initiatives, including those of ESCAP, that are making transport systems cleaner, safer, more efficient, and more affordable. It provides an update on the status of the Asian Highway and Trans-Asian Railway networks, seaports, airports as well as progress in the development of intermodal linkages such as dry ports. It describes regional strategies and mechanisms to facilitate regional transport operational connectivity. The Review reports on the initiatives of the cities of the region to stem the social and economic losses from increasing congestion and pollution. It acknowledges the increasing role of intelligent transport systems for urban and inter-city mobility and recognizes the role of rural accessibility. It also reports the region’s greater interest and the need in further improving road safety.